The practice of auditing and safety inspections are an inherent must, regardless of industry. This May, the EPA announced renewed emphasis on Self-Disclosed Violation Policies. Included in part 3 of the EPA’s FY 2018-2022 Strategic Plan, the goals are to boost voluntary participation from relevant industries in order to lower the recurrence of environmental violations. Accomplishments of this nature are attained through audit submissions that help increase industries’ facility efficiency, safety, and attentive management of hazardous and other chemicals and wastes. Chemical Safety’s Environmental Management Systems (EMS) provides software solutions that support these types of Environmental Health & Safety goals. The EMS Facility Management technology streamlines organizations’ processes towards EPA auditing and inspection standards. By using our comprehensive audit and inspection technology tools, clients have been able to tailor their operations to meet industry requirements. EMS tools allow for the creation of custom audit and inspection questionnaires and corrective actions triggered by inspection results and managed by the EMS automated task management process. The EMS Audit and Inspection tools also support waste and chemical inventory auditing and reconciliation, as well as a wide range of custom and regulatory reporting for Key Performance Indicators (KPI’s), Tier II, OSHA, and more. From mid-year 2017, several organizations using EMS for chemical inventory and waste management had suffered fines, injury compensations, and facility inefficiency all due to poor maintenance of workplace and safety conditions. These organizations opted into using the EMS Audit module. Since then, their incorporation of an integrated auditing tool that is designed to operate in conjunction with existing inventory and waste processes has reportedly improved efficiency and workplace and safety conditions culminating significant cost reductions. Clients were empowered to perform location audits that identify job-related or workplace Hazards or Items of concern, auto-generate tasks for corrective action, and generate KPI reports that have demonstrated improved site and job operations. Teleologically, improved auditing with EMS effected cost-benefit efficiency, higher safety standards, and incident or accident reductions within facilities. Similarly, the use of the EMS Audit module has been extensively utilized by clients to inspect waste storage and accumulation areas in order to ensure that the storage of drums and lab packs adheres to DOT compatibility rules and that their physical condition is of acceptable standards to prevent potential exposures to employees or that pose environmental degradation. Audit Summary Reports illustrate these findings so that location supervisors can perform necessary actions to mitigate identified issues. In such cases, the reconciliation of waste storage locations has greatly improved regulatory reporting like the Waste Biennial and Federal Tier II reports. One of the many strengths to Chemical Safety’s EMS audit and inspection software is the flexibility to create custom-built audits that can be geared to service nearly any process a facility may be performing. To aid management responsibilities, the EMS Audit Module and Builder feature design processes for the selection of question types, question-answer conditions, autosave functions, severity rating operators, and system recurrences to inform and notify audit personnel of upcoming, pending, or completed audits. Audit responses can be configured to generate Task Items which enable users to assign appropriate personnel to take corrective actions, appropriate costs, and set target and follow-up timelines. Facility Key Performance Indicators, Audit Summaries, and other report types can be generated based upon audit and task information that has been accumulated within the EMS system. These key features are instrumental in order to rigorously assess the activities undergone within a facility. 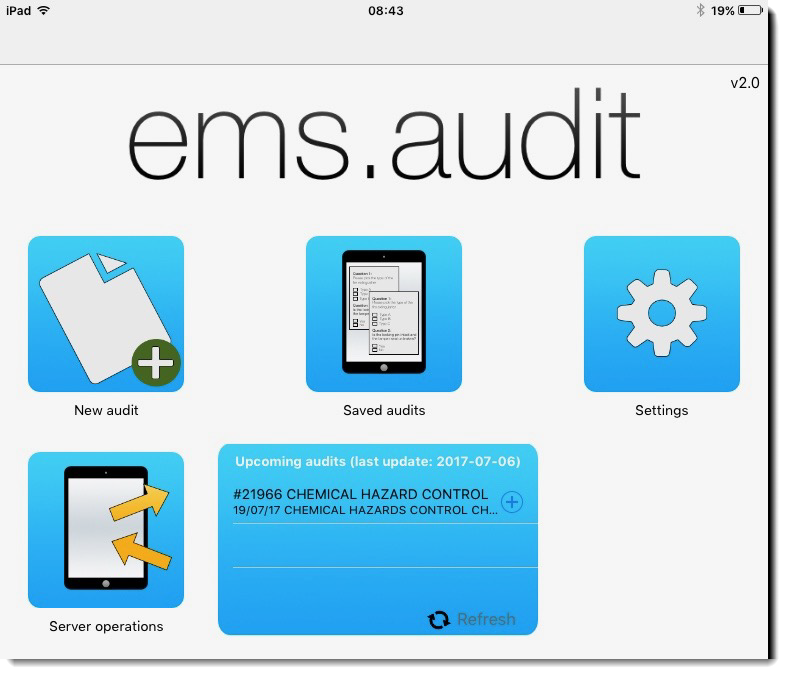 EMS audits are operable online as well as from the EMS.Audit Mobile application, which is available on iOS, Android, and Microsoft Surface devices. Conducting inspections using mobile devices improves efficiency, accuracy, and safety by harnessing real-time execution capabilities with auto-synchronous communication between the Mobile and Web versions. As a proponent of this, the EMS.Audit mobile application enables users to perform their audits or inspections offline in order to perform tasks in highly secure or safe conditions which may not allow internet access. Chemical Safety’s EMS Facility Audit and Inspection tools help organizations operate safely and efficiently while simultaneously reducing costs and mitigating operational concerns. By stringently optimizing facility standards of practices in conjunction with business goals, organizations can assume on-par standards in accordance to EPA and other regulatory agencies’ mandates and recommendations. For more information about the EMS Audit and Facility modules, visit www.chemicalsafety.com.